I've been receiving complaints. I haven't been to see one of my favorite chefs in a while, and he's not shy about letting me know that he hasn't been gettin' the love from me. After attempts at a December visit fell through, I waited until Uwe Opocensky returned from his trip to the US to book myself a table at the Mandarin Grill + Bar. As usual, I didn't bother ordering. I just let Uwe know in advance that I was coming, and he knew that he would have carte blanche to throw at me whatever he felt like. The only comment I made to Uwe before dinner started were that "I don't do fish sperm" and "we're not as hungry as you think we are". After all, just about every single visit I've paid Uwe in the last 3 years has resulted in my stomach almost bursting while still in the restaurant. First came the little nibbles. We were told to start with mushroom sabayon. Very nice and warms the stomach to prep it for the coming onslaught. Fermented sourdough sticks with pickled onions and flowers - crunchy and pretty. Truffle toast - when you get a black plate with a load of black truffles on it, it's hard not to get excited. Of course Uwe had to tell us that there's more truffle coming. The toast was soaked in truffle jus, with egg yolk, a ton of black truffle shavings on top, a spray of dashi (出汁) and a sprinkle of salt. Really fragrant and tasty. The only issue I had with it was that the toast itself was too wet and soggy, and I didn't like the sensation of grabbing it with my fingers. Sevruga - a little more "fishy" than expected. Golden Oscietra - surprisingly this was the mildest of the three. Beluga - lots of delicious fishy flavors here. I was a little surprised that the only utensils on the table were knifes and forks, so I asked for some caviar spoons. We were given three mother-of-pearl spoons so I tasted each type of caviar on its own. Charcoal grilled leeks - cut open and into sections so we'd eat the juicy interior. Slow-cooked duck egg yolk - beautiful to use as a "dip". Parker House roll - charcoal grilled. So I added some runny yolk onto the Parker House roll along with some diced chives, put the caviar on top, and had it together with a bite of the grilled leeks. Delicious and satisfying. Tartare: Japanese, Miyazaki, baguette, mushroom, bone marrow - raw Japanese beef from Miyazaki Prefecture. Lifting up the top sheet of beef reveals the tartare underneath. The sheet of raw beef was nice and fatty, and tasted clean and beautiful. The tartare came in reasonably big chunks, which were a little chewy. Very tasty, too... and the seasoning was seemingly a little on the sweet side as well as being a little spicy. The baguette was charcoal grilled, with bone marrow mayonnaise, pickled mushrooms (trompette de la mort? ), herbs, flowers, and deep-fried shallots with fermented mustard seeds on top. There's a lot of stuff on this here baguette, but the combination worked to balance out the fatty beef. Langoustine: Faroe Island, grilled, kombu - Uwe said that as a result of a dinner collaboration last year with René Redzepi from Noma, they are now using the same supplier for langoustines from the Faroe Islands. Seeing that there were no utensils on the table, I wasted no time in posted a picture online with the caption "no fork use"... 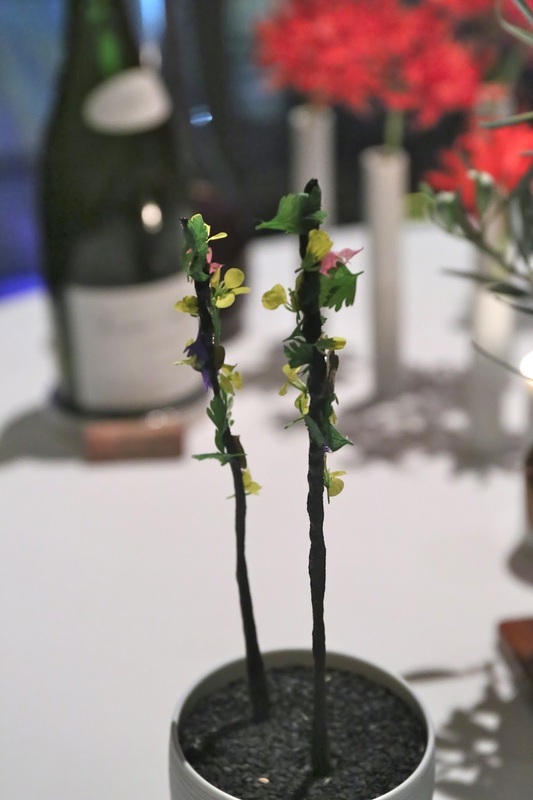 When I finally got around to asking the staff, though, I was told there we were meant to use our hands to grab the vines in order to lift the langoustine off the plate. The langoustines - which arrive live - are seared and sprayed with a sake (酒) dashi (出汁) vinegar and sprinkled with dark roasted kombu (昆布) powder. Served with langoustine reduction on the side. Absolutely beautiful. The flavors of that langoustine... just WOW! So fresh, so sweet, and so full of the flavors of the sea. Scallop: Japanese, Hokkaido, diver caught, truffle - Uwe said there were more truffles coming, and here they were! The scallops were cooked in its own stock on the grill, with a little bit of butter, and not so little bit of black truffles. Yum. Venison: Welsh, Rhug Estate, organic, choclate, parsnip - venison loin came with a chocolate leaf on top, along with freeze-dried blueberries. Then venison ragoût was ladled on top of it all, melting the chocolate leaf so that it mixed with the sauce. Initially we were told that there would be a vegetarian pasta course. As it turns out, there was a mound of celeriac "pasta" underneath, which were ribbons of celeriac. The venison was very gamey, and my friend had a little trouble stomaching it. I, on the other hand, love gamey meats... and the chocolate really worked well to soften the blow of rare game. But there was no doubt that this was a heavy dish, and certainly not "vegetarian" and light! Stuffed shiitake mushroom with duck confit, foie gras, and chicken mousse in honey soya duck jus - these were giant shiitake mushrooms, and there was a lot going on here. You can kinda see the chunks of smoky duck confit and foie gras beneath the top layer of chicken mousse. Very tasty, and the duck jus came with coriander seeds and coriander pesto. And it looked very, very beautiful when it was done! Uwe cut two not-so-small slices for me, bearing in mind that I prefer my pork with plenty of fat. Served with apple purée, Savoy cabbage sautéed in pork fat, fermented mustard seeds, Savoy cabbage and sauerkraut purée. The pork was absolutely fantastic. Cooked just about perfectly, with parts still pink, soft, and incredibly tender - like a rare piece of steak. Biting down on the chunks of fat was pure nirvana. What an amazing hunk of meat! Unfortunately, here is where I hit a wall... I have had soooo much food by this point that I found myself unable to take any more. For someone who never says "No" to pork fat, I found myself feeling a tiny bit nauseated at the taste of it. I just had to stop before disaster strikes, so I left part of the pork on my plate. I didn't even touch the "light mashed potatoes" served on the side. What arrived was an array of Japanese citrus fruits, with blood orange, yuzu (柚子), dekopon (デコポン), mikan (蜜柑), and grapefruit. Frozen pulp was spooned into the middle of the plate and covered with crème Anglaise. Garnished with basil and mint. Thankfully, this was a pretty light and refreshing finish. But we weren't gonna get away without the mignardises... which were presented on a chocolate log. A mix of white, milk, and dark chocolate covering hazelnuts and raspberries. 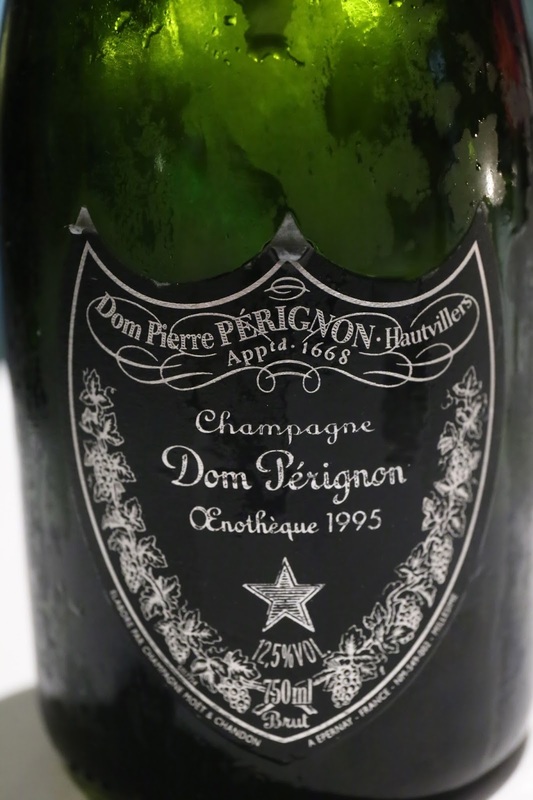 1995 Moët et Chandon Cuvée Dom Pérignon Œnothèque - nose was so fragrant and floral, with toasty notes initially, then nice and caramelized. What a beautiful wine! 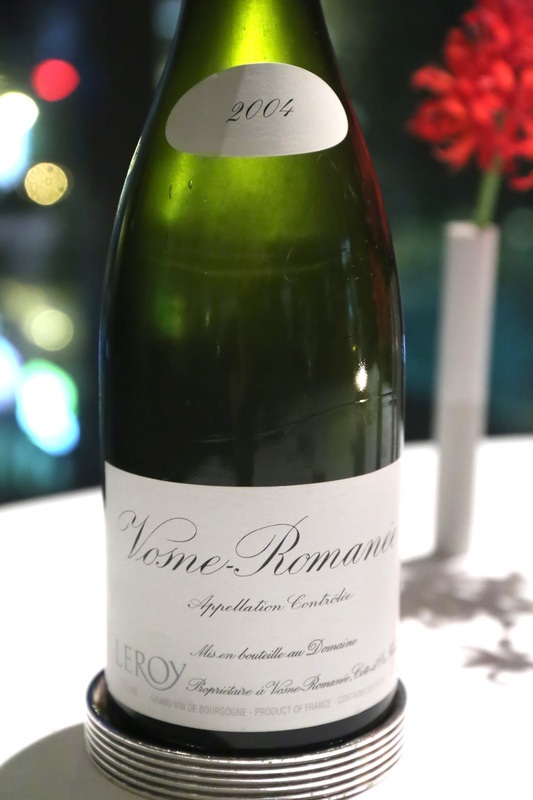 2004 Domaine Leroy Vosne-Romanée - decanted for about an hour prior to serving. Nose was soooo floral and fragrant, with violet notes. A little toasty, and incredibly sweet with red fruits. An incredibly satisfying evening for the pair of us. Uwe's cooking may not look as fancy as that of other chefs in town - his dishes certainly look a lot more "simple" - but the ingredients are top-notch and the flavors are more "pure" and straightforward. And I love the theatrical flair of some of the dishes, as every dining experience here is simply a lot of fun. So why do I not come back here more often?! P.S. At the end of the evening, as I was seconds from leaving the restaurant with a big smile on my face, my phone rang with the news that grandma passed away at the grand old age of 101 (and a half). It was not a complete surprise as her condition had deteriorated pretty sharply in the last few months, but I am thankful that her departure was not the result of some long and painful illness. She had lived a long and good life, and continues to live on in my memories. I'm a little sad that I did not get to see her while I was back in Taipei just a few days ago, but at least I got to celebrate her life at her 100th birthday a couple of years ago. Deepest condolences for the passing of your beloved grandma. Given the extortionate prices this restaurant is charging, why don't they employ a sommelier ?